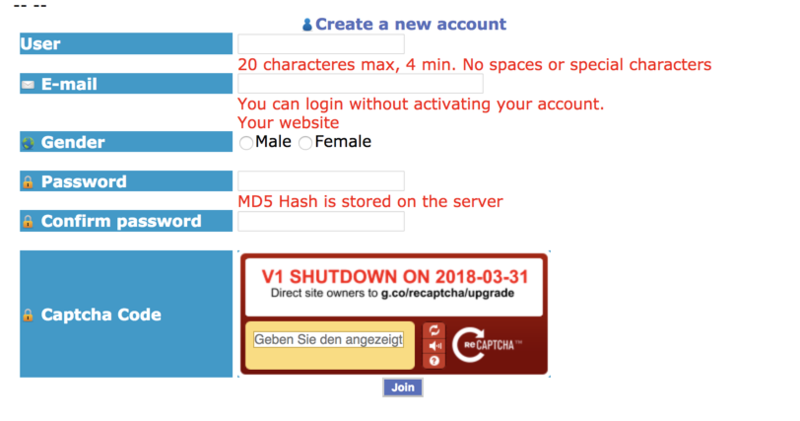 the signup seems broken since it is using the old V1 re-captcha which is about to go off. At least I was not able to signup sadly. Just seems to have worked. But it is the captcha. It literally says to inform the site owner that he needs to rework the site to NOT use v1 re-captcha anymore and does not show the captcha itself. After like 10 tries it showed a captcha and I am through. I've just made a test, and there was a captcha at my first attempt - or maybe I don't understand what you're saying? What browser are you using and with what extensions? What's your OS too? Safari. You are getting it right. Just tried again with chrome. See attached image. @jpk have you install ublock origin? If not, could you install it and try again, please? I've tried without UblockOrigin and haven't got this warning. But maybe it depends of the country you're in?